The Pittsburgh Penguins play the Carolina Hurricanes at the PNC Arena in Charlotte, NC this evening. The Hurricanes (9-8-1) lead the Southeast division while the Penguins (13-7-0) lead the Atlantic division. Both teams have lost their most recent game and have not faced off against one another yet this season. They have the same goals against totals (54) however the Penguins have about 10 more goals than the Hurricanes. The real story behind this game is the fact that this is Jordan Staal’s first time playing against his old team. Staal was instrumental in both of Pittsburgh trips to the playoffs in 2008 and 2009. 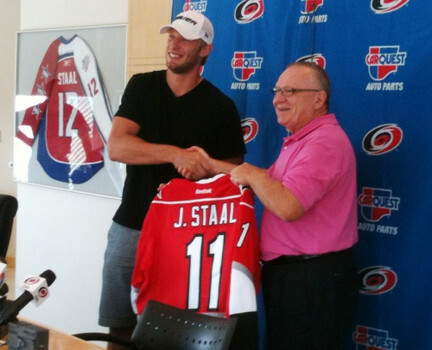 He now joins his brother, Eric Staal, on the team. This game is also Brandon Sutter’s first time playing against his former team. With Evgeni Malkin out due to a concussion, Sutter will be given much more responsibility on the ice. His lackluster performance as of lately will hopefully be put to an end in this matchup, fueled by his fire against the Hurricanes. PHILADELPHIA (AP) – Beer lovers across the U.S. have filed $5 million class-action lawsuits accusing Anheuser-Busch of watering down its Budweiser, Michelob and other brands. The suits, filed in Pennsylvania, California and other states, claim consumers have been cheated out of the alcohol content stated on labels. Budweiser and Michelob each boast of being 5 percent alcohol, while some “light” versions are said to be just over 4 percent. The Boston Bruins (11-2-2) and the New York Islanders (8-10-1) face off this evening at Nassau Veterans Memorial Colliseum at 7:30 PM Eastern Time. 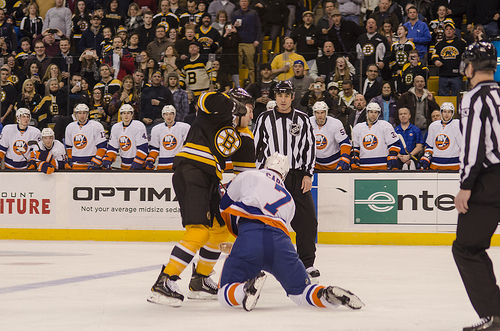 The Islanders started off the season strong and fought the off the Bruins rough play into the 3rd period during their first meeting in Boston on January 25th. The teams were tied going after the 2nd period but the Bruins took hold of the 3rd almost immediately with a goal by the captain, Zdeno Chara followed by a goal to cap off the win later in the period by Patrice Bergeron. The Islanders have been brought back to reality as the other teams have put them in their place. (They are back the bottom 4 of the conference and tied with Winnipeg). It should be an easy win for the Bruins tonight. While they have one of if not the best power play kill in the league, their success on the power play had been dismal since recently. Their depth in scoring and assisting will make them difficult to beat. However…the Islanders are starting their newly acquired goalie in his first game of the season, the krazy keeper Tim Thomas. With Thomas in net, this could actually be an entertaining game to watch. This beer is consistently ranked as one of the favorites coming from the Long Island microbrews. Blue Point refers to it as their “All-American brew” and because the Islanders are most likely going to mauled by bears tonight (and a chunk of the proceeds go to Superstorm Sandy relief), crack yourself open a nice brew.